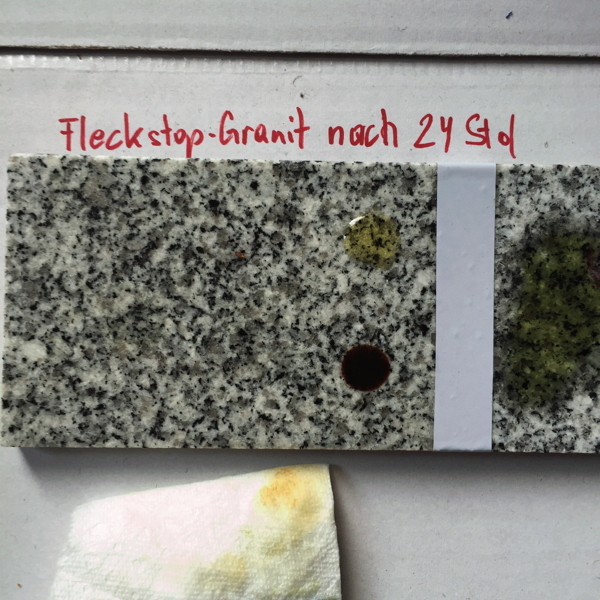 Application EBIPHOB spot-stop granite can be applied on all polished or even granite surfaces. Tiles in the shower or bathroom and kitchenettes can be cleaned much more easily. Oil or fat cannot enter which is a long lasting spot protection. If the surface gets in contact with oil or fat, this pollution can be removed without residues within one hour. Where to use Ideal for polished granite (even or with structure, on kitchenettes and granite tiles, window sills, gravestones, sheetings of walls, storefronts, as well as on concrete bases and enclosures of swimming pools. Status quo Our competitor`s products still contain ingredients that can cause damage to the environment and to your health, preventing a permanent arming. Have a look at “completely without“ to find a line-up (consisting of data sheets) of ingredients we do not market anymore but which enable you to receive a better and long lasting result. However, our competitor´s solutions are more difficult to apply gaining worse results. Without... Hydrocarbon, C9-C11, n-alkali, iso-alkanes, cyclic compounds, benzol, VOC (solvent), aromatics, silicones, polymers, oils, waxes or resins. 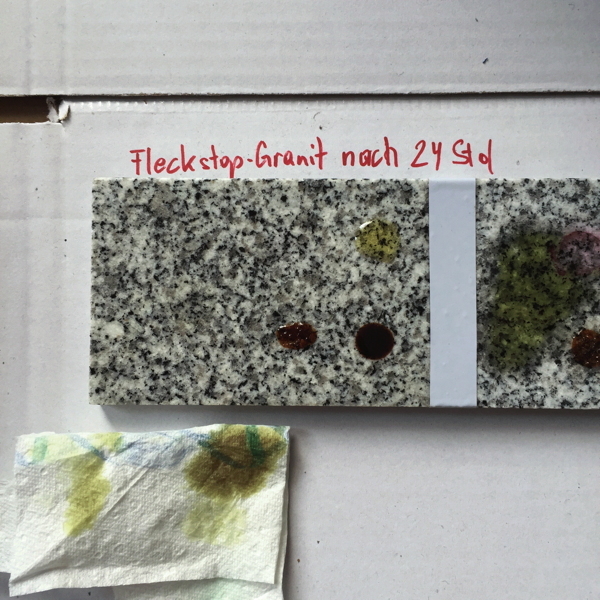 Unlike many other products, EBIPHOB spot stop granite does also not use any fluorines. New Spot-stop with “EEE“ (Ebiphob Express Effect) without ingredients causing damage to the environment - from now on. 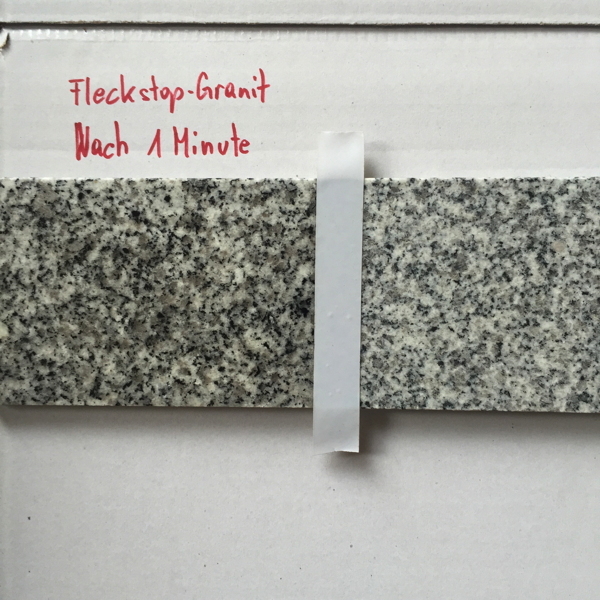 Spot-stop granite forms an impermeable structure consisting of a silicone matrix which cannot be dissolved. 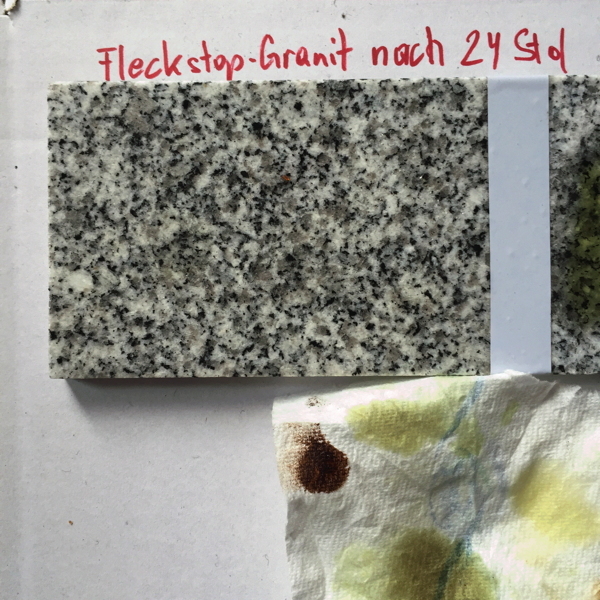 Blend EBIPHOB spot-stop granite does not have to be blended, it comes ready for use in a bottle. 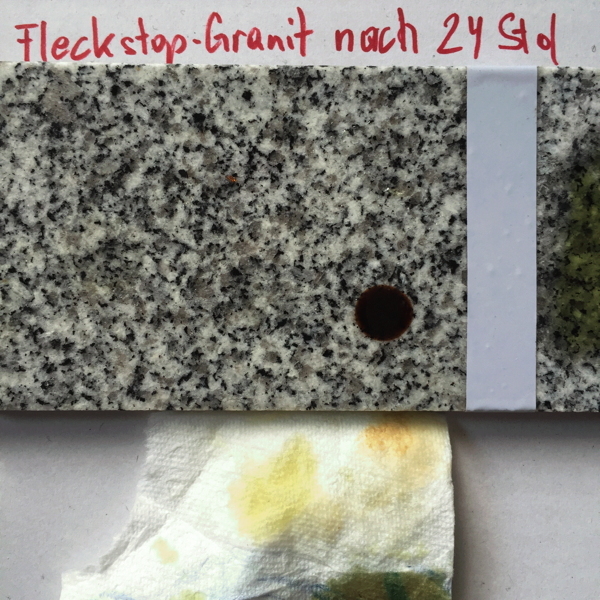 How to use EBIPHOB spot-stop granite is applied in a very thin film allover the surface with a cloth or a wiper. Residues staying after drying can be washed away with pure water or can be polished if the surface is dry. Depending on the type of stone it can be necessary to repeat the impregnation after a few minutes. Visual control for any bathocromatic effect if applied again is the easiest way. If it shows, apply again, if not, the matrix to protect is already formed. Leave 24 hours between the impregnation and oil contact of the surface. On some very absorptive types of stone the impregnation should be tested 24 hours after applying. If only a little bathocromatic effect shows, repeat impregnation until the effect does not show anymore. Trading units Samples from 5 ml up to cans (25 liters)Distribution partners can obtain the product under their own label. Costs Information given on request depending on the size of the trading unit. 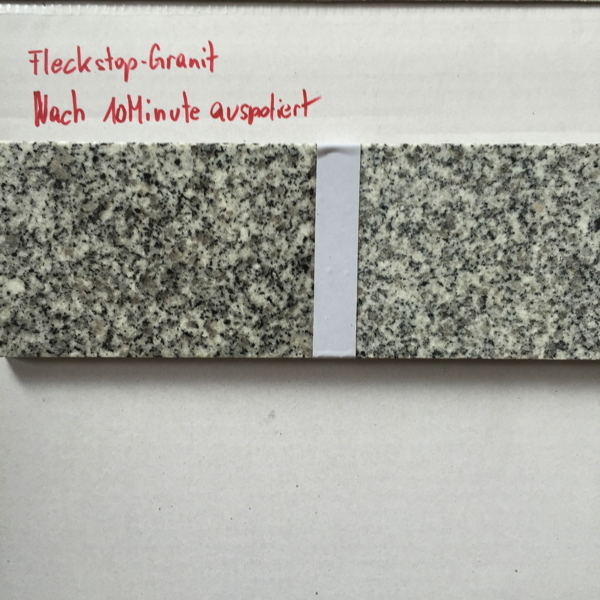 Conventional grey granite.On the left hand side you see the surface just after appliance. As the solution enters, the surface gets darker. It is just applied, no rub and no adhesive residues will occur. A film will not be visible and if the solution is not applied all over, missing spots can be filled afterwards. Just wipe once again, that´s it.. 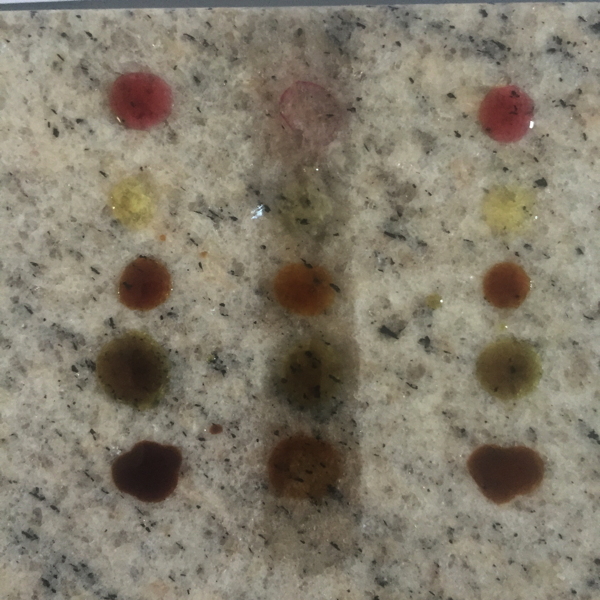 Here you can compare the difference between the impregnated and non- impregnated stone getting into contact with various substances: core oil (left), red wine (in the middle and on the top), soy sauce (in the middle and on the bottom), sunflower oil (right and on the top), balsamic vinegar (right and on the bottom). 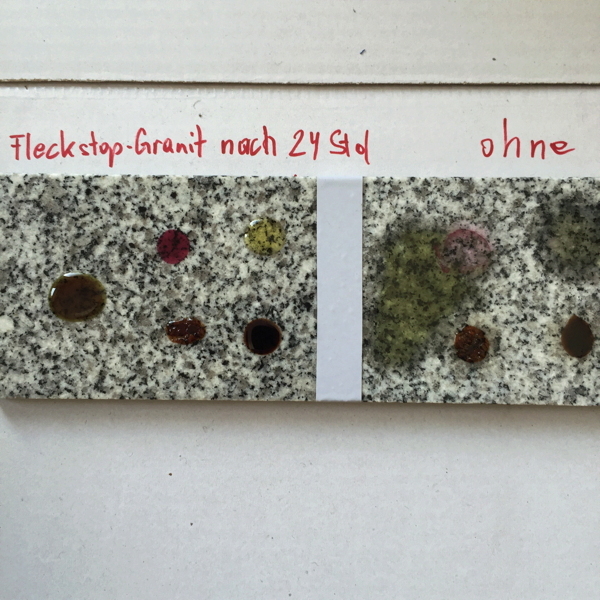 After 24 hours, the color difference of the stone can no more be easily noticed. On the right half, you see spots, the left one is spot-free. 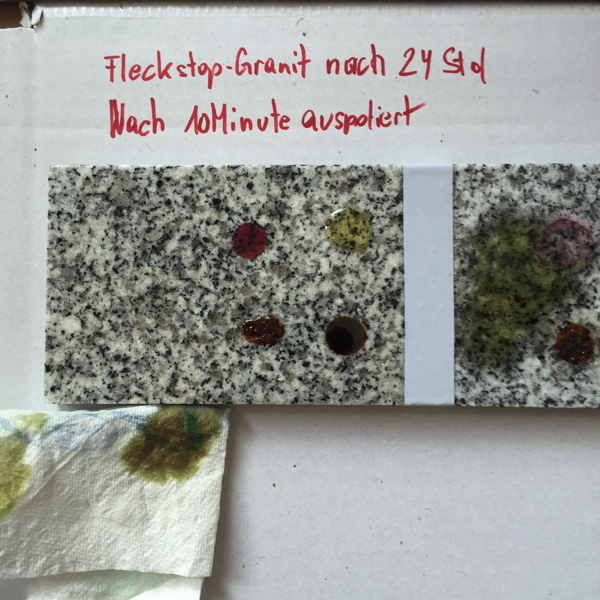 Here is the proof of a removal of the spots without residues: the non-protected half shows pollution which is no more removable as it has already entered the stone. The protected half shows no spots after the core oil is wiped away. Here you see the same arrangement with red wine. The result: no visible spots. The soy sauce was dried completely but did not leave any visible residues. Sunflower oil also did not harm the stone. Finally, the balsamic vinegar is removed and the stone looks like new – thanks to spot stop granite. 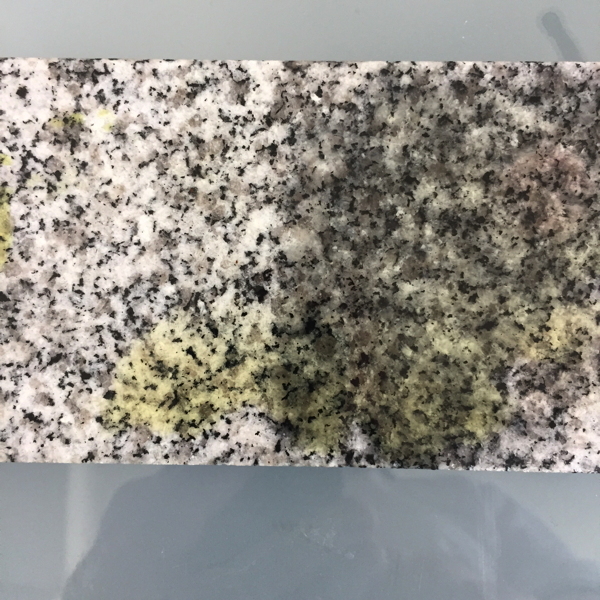 Here you see one more quality proof of spot stop granite: sunflower oil was spilled over this stone, the right half has no spots after two weeks; the left side was absorbing the oil like a sponge and has left the stone on its rear side. Granite Imperial White is somewhat tighter and was kept in its natural state in the middle while little impregnated on the left side and perfectly protected on the right (re-impregnation after a few minutes) - just as a trial.Here you see clear results after 24 hours: the right side is perfectly protected, the left one has absorbed some core oil. Always check any bathocromatic effect after applying by re-applying the solution a few minutes later. If this effect shows, re-impregnate. To make sure, we recommend re-application 24 hours after the first application.